What is the Prosper Northland Trust (PNT)? PNT is a community-led organisation primarily concerned with ensuring viable projects that enhance the economic growth and development of Whangarei and Northland are able to proceed. The Hundertwasser Wairau Maori Art Centre is their first project. After the June 2014 WDC meeting (where Council voted not to proceed with the HAC project), a number of Whangarei residents were left standing in the Council lobby in sad disbelief. Over the following weeks the group met informally a few times and agreed that not only could the art centre be built privately, but also that it should – and that a they should form a Trust to pursue the idea. Not long after, the WDC requested members of the public make submissions for the future of the old NRC/Harbour Board building and PNT submitted their new HWMAC proposal. The Prospect Northland Trust has been registered as a charitable trust under the Charitable Trusts Act 1957. This is the appropriate structure for the organisation. It provides a mechanism for the trust to act through a board of trustees. It is also the structure preferred by local authorities, government departments and funding organisations. PNT registration documentation can be viewed on the government register of societies here. Yes. Propser Northland Trustees went to Vienna to meet with the head of the Hundertwasser Non Profit Foundation and a new relationship was forged. What is the PNT HWMAC proposal? When the WDC invited the public to submit ideas for the future use of the former Harbourside/NRC building in the Whangarei Town Basin, PNT put forward a proposal to build the Hundertwasser Wairau Maori Art Centre. The new PNT proposal involves building the Hundertwasser-designed art centre according to the original plans (which had already been progressed to building consent stage) and raising the $10m required for the refurbishment part of the project from non-WDC sources. PNT proposes that Whangarei Art Museum Trust (WAMT) be the eventual operators for the new art centre. The proposal still requires the WDC – as landlords of the building – to commit $2.8 million dollars worth of work to getting the building prepared for the Hundertwasser refurbishment. The new proposal does not require any ongoing ratepayer funding for operation and the entire centre would be gifted back to the WDC after 10 years of operation. Is it really free to WDC ratepayers? The Hundertwasser refurbishment itself will be free to ratepayers. But PNT are very clear that the WDC – as landlords of the building – will be asked to commit $2.8 million dollars to getting the building prepared for the Hundertwasser remodelling (earthquake strengthening and ice road access for fishing boats). The WDC will also have to agree to receiving only a peppercorn rental income from the art centre. The HWMAC proposal does not require any ongoing ratepayer funding for operation (which will be underwritten, if required) and the entire centre would be gifted back to the WDC after 10 years of operation. Wouldn’t it be cheaper to build it new somewhere else? Possibly, but there would be no point as an alternative building would not be supported by the Hundertwasser Non-Profit Foundation. The former Northland Harbour Board office building is the building Hundertwasser himself identified as suitable for his “architecture doctoring” and the design for which he drew. The support of the Hundertwasser Non-Profit Foundation in Vienna, which will loan Hundertwasser artworks worth millions to the finished Art Centre, is dependent upon the use of the former Northland Harbour Board building. The Foundation guards Hundertwasser’s name and his concepts. It will not allow any copycat buildings. Anything associated with Hundertwasser must be authentic. The Town Basin building is the only site the Foundation will support for the creation of the Hundertwasser Art Centre as it is the only building with a direct link to the late artist. The HWMAC being the last authentic Hundertwasser-designed building in the world is what will make it a national and international tourist attraction and bring economic, cultural and social benefits to Whangarei and Northland. The Foundation envisages the Centre being the starting point for Hundertwasser scholars to take tours to the Kawakawa toilets designed by Hundertwasser and to the artist’s former estate at Kaurinui, where he is buried as he wished beneath a tulip tree. Won't it pinch Kawakawa's claim to fame? The Whangarei HWMAC does not take anything away from Kawakawa, and will in fact mean more tourists for the town and its famous toilets. “In Kawakawa there has never been partners capable of such a national and at the same time international project who could realise, operate, and successfully create an undertaking like the Whangarei Hundertwasser Art Centre. “The remodelling of the existing public toilet in Kawakawa was a gift from Hundertwasser but he had to be convinced, to be pressured by Mr Harel into accepting to do this as a homage and respect to his long year friends living there. He also did it as a favour to Mr Harel under the condition that he come to NZ and arrange everything needed so he does not have to deal with it. I did this and I came and talked to the respected business woman, Patti Meldrum, representative of the business people, and talked to an engineer and then Hundertwasser started to build the model together with Richard Smart and all the rest is history. Hundertwasser’s concern was that he would lose his peace and anonymity once the Toilets were completed. “So Kawakawa has got their Hundertwasser attraction already and they do not need another one. Hundertwasser always said that something is only precious and special if it is unique and rare. Things which are duplicated and which you have en masse are no attraction, are nothing special and for sure not precious. Especially not when duplicated in such a small area like Kawakawa. “Last but not least, Kawakawa will be the largest benefactor of the Whangarei Art Centre. As a matter of fact Whangarei will sponsor Kawakawa through all its activities and creating of the Hundertwasser Art Centre. Whangarei will provide and pay the way for more tourists to come to Kawakawa. The Foundation even agreed to let Richard Smart have tourists visit Kaurinui which will involve Kawakawa. 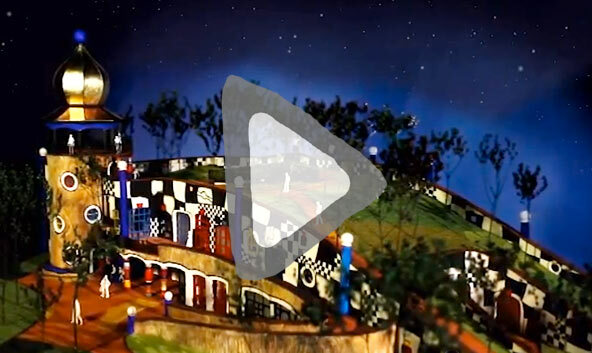 To see a time0lapse video of visitors to the Kawakawa Hundertwasser toilets, visit this YouTube link. The land and building will remain in WDC ownership. The improvements to the building (ie the Hundertwasser refurbishment) will be owned by Prosper Northland Trust for the first 10 years and managed by the Whangarei Art Museum Trust (WAMT). You can read a press release regarding the operation of the HWMAC by WAM here (May 2015). After 10 years operation the art centre refurbishment is gifted back, in its entirety – to WDC and the people of Whangarei. Who will run the HWMAC? Under the PNT proposal, once completed, the Whangarei HWMAC will be run by the Whangarei Art Museum Trust (WAMT), the organisation that currently administers the Whangarei Art Museum. Who is WAMT and how are they involved? Whangarei Art Museum Trust (WAMT) is a special purpose Trust that operates the Whangarei Art Museum and holds responsibility for the extensive Whangarei city art collection. WAMT was never the initiator or driver of the earlier Hundertwasser Art Centre (HAC) project, which was entirely conceived and managed by the Whangarei District Council. WDC included WAMT in the project as the eventual operators of the Hundertwasser Art Centre (although operators were not specifically named in the WDC/HNPT agreement). WAMT is a Council Controlled Organisation (CCO) but it is also an independent legal entity. While there is a Memorandum of Understanding between WAMT and WDC, the Council cannot govern how the Trust operates or direct the Trust to act in an way that would be contrary to the purposes laid out in the WAMT Deed of Trust. The WAMT trust deed clearly shows the parameters under which the Trust operates, including principles such as maximising the benefits of an art museum for the Whangarei district, fostering an awareness of art and stimulating and enhancing the artistic and cultural life of the Whangarei district. When the new Whangarei council voted in June 2014 to no longer support the HAC project, they issued no instruction to WAMT relating to that decision. Shortly after, WAMT was approached by a group of Whangarei residents (those who later formed PNT) and asked if it would consider (a) supporting in principle a revised community-led Hundertwasser art centre project and (b) asking funders of the previous project if they would consider their funding to be able to be retained until a new project could be fully scoped. Referring to it’s own trust deed and guiding principles, WAMT agreed to both those requests. Of the $4.5m WAMT raised for the HAC, approximately $2m remains pledged to the principle of a Hundertwasser art centre. Furthermore, the Lotteries Commission has invited WAMT and PNT to reapply for Lotteries funding (their original pledge of $2.5m expired in November 2014). Funders and pledgers remain in contact with WAMT and will be given the opportunity to re-commit or withdraw their support for the new project once WDC makes a decision on the project. PNT included WAMT as their preferred operators of the new HWMAC and as their preferred fundraising body for the new project, should WDC agree to allow it to proceed. The proposed Harbourside project also included WAMT as preferred operators but had not discussed this option with WAMT prior to making their submission to Council. Who are the WAMT Trustees? Grant Faber is WAM Trust Chair and has extensive international experience in business management. The Taiharuru Farms Lodge owner is chair of Discover Whangarei Heads Tourism Group and a member of the Northland Tourism Development Group. Grandson of colonial artist TL Drummond, he actively supports the Whangarei Arts Symposium and the Discover Whangarei Heads Art Trail. Sharon Morgan is a Whangarei District Councillor and Deputy Mayor. A trustee of the district’s Culture, Heritage and Arts Resource Trust (CHART), Sharon has worked extensively with Whangarei’s cultural and heritage sector. Councillor Morgan instigated the Whangarei Sculpture Symposium and was instrumental in finding a home for the city’s Community Arts Centre. Andy Britton BSc (Hons) is a chartered accountant and retired partner of PriceWaterhouseCoopers NZ. Currently NorthTec’s director of corporate services, he is a former chair of the Culture Heritage Arts Resources Trust (CHART), the Northland Regional Council Community Trust and its subsidiaries Enterprise Northland and Destination Northland. Te Warihi Hetaraka (Ngati Wai, Tainui, Ngapuhi, Ngati Whatua) is a tohunga whakairo whose works are displayed in public buildings nationwide. Winner of Creative NZ’s Outstanding Individual Contribution Award in 2007, he is cultural adviser to Whangarei Art Museum and Ngatiwai Trust Board, and a pouwhakahaere for Te Puni Kokiri. Adrienne Dietrich is an accomplished artist and winner of numerous awards including the Australia Day Medal for contribution to the arts and an Entrepreneur Award for initiating Queensland’s Clifton Arts Workshops. She now conducts painting workshops in Whangarei and co-ordinated this year’s inaugural Discover Whangarei Heads Arts Trail. Kirsty Hughes is a communications strategist with over 25 years marketing and advertising experience, working with many of New Zealand’s most recognisable brands. She runs her own specialist communications consultancy. Does the 20/20 Plan for Whangarei include the HWMAC? The 20/20 Plan, which was subject to wide community consultation, concluded that the Town Basin area required an “iconic museum” as an attraction to make the precinct a vibrant area for tourism. YES! Whangarei believes the Hundertwasser Wairau Māori Art Centre will be that iconic attraction. It will be one of the most recognisable buildings in New Zealand and house an international-standard art museum exhibiting original Hundertwasser works and a dedicated Māori Art Gallery. How much will the referendum cost? Council have budgeted $80,000. By comparison Auckland expected a referendum to cost $1,500,000 with $1.10 per voter in postage and a single A4 double-sided explanatory insert plus $300,000 in promotion. The $300,000 promotion was based on the annual plan promotion cost. ($1.10 per voter equates to around $61,000 leaving $19,000 for other communications). What does it mean when they say it is a binding referendum? It is our understanding that a binding referendum is a council resolution that is enacted by the outcome of a referendum. The referendum has moral and political weight but does not legally prevent council from reversing it next time they meet. Should the referendum not favour the HWMAC proposal then Council will still need to go through the annual plan amendment process to remove the original HAC project (which it has never done). This would require them to invite further submissions and appraise those with an open mind. We do not know what the cost of that process will be. What is the Harbourside Proposal? The Harbourside proposal was prepared by a group called Future Whangarei in response to the WDC call for submissions for future use of the old Harbour Board/NRC building in the Whangarei Town Basin. It proposes to encompass a maritime museum, a maori art gallery, a digital arts centre, office space, a conference space, the relocation of Whangarei Art Museum Trust (WAMT), CHART and a viewing platform on the roof. We understand that (at the time of writing) CHART and WAMT are in discussions with Harbourside representatives to ascertain the viability of those organisations relocating to the proposed development. Preliminary costings were around $8 million to ratepayers in the first 5 years. More information is available on the WDC website here. The project proposal was signed by financial advisor, property developer and former WDC councillor Wally Yovich. Whangarei designer Richard Cranenburgh was the original project manager for Harbourside, but following his resignation approximately one week after the 12 November Extraordinary Council meeting, project spokesperson Wally Yovich is now the first point of contact. Future Whangarei they do not appear to be registered as a Trust or have a Trust deed. YES! Whangarei does not know of anyone other than Mr Yovich associated with the Harbourside project. 21 submissions were received of which seven were considered seriously. Four of those were judged as being ‘finalists’, one of which pulled out in order to back the HWMAC proposal. The remaining three were graded against an assessment matrix (prepared by the WDC 20/20 Committee), with the HWMAC gaining first place and Harbourside coming second. It is not known how the other finalist (the AMP Proposal) scored in comparison to HWMAC and Harbourside or why it was not considered for referendum. Why is $100,000 being spent on developing Harbourside? At the 12 November Extra-ordinary meeting the Whangarei District Council voted to spend $100,000 in order to develop the proposal to the extent where it’s feasibility and potential can be assessed by the public. It is our understanding that WDC is currently working with Harbourside to prepare the project for external assessment. Are city councillors involved in the Harbourside proposal? According to information given at the 12 November 2014 WDC meeting, all WDC councillors were invited by the Chief Executive to declare any conflicts of interest with any of the proposals prior to the submissions being received. At that time all Councillors stated they had no conflict of interests (bias) when evaluating the Harbourside proposal. If the building is demolished could something else happen with that space later? It’s unlikely. While the binding nature of the referendum does not make it irreversible, anything that happened in that space afterwards would reasonably expected to exceed the bar of being free to WDC for 10 years and 80% externally funded. Will the Wairau Maori Art Gallery go into Harbourside if that goes ahead? No. The Wairau Art Centre – the only curated, contemporary Maori gallery in New Zealand – is unique to the HWMAC. The Wairau Maori Advisory Panel, formed to consult on the development and curation of the Wairau Art Centre, has indicated they will not support the centre being part of the Harbourside project. See the Maori Involvement FAQ page for more information. Why wouldn't Yovich/Harbourside meet with Deloitte? We can only speculate why Wally Yovich refused to meet with Deloitte. No reason was publicly given. Deloitte were employed by WDC to do a pre-referendum feasibility study on Harbourside and a refreshment of their former report on HWMAC. The results of those studies – along with the Visitor Solutions (2011) and Crowe Horwath (2014) reports – have formed the basis of the referendum information prepared by WDC for voters. At the time we thought the refusal to meet might be because Yovich thought the Harbourside numbers would not bear close scrutiny. We also felt he may want to attempt to discredit the Deloitte findings at a later date and not meeting with them would aid that stance. This theory has been born out by recent comment from Yovich in a local newspaper (Whangarei Leader, May 19 2015) where Yovich said “Harbourside will make an annual cash profit and not a loss as estimated by council.” He went on to further refute the Deloitte findings by stating HWMAC would make a loss, not a profit but without any supporting independent justification for that claim. What did Deloitte do & what was the result? Deloitte were employed by WDC to do a pre-referendum feasibility study on Harbourside and a refreshment of their former report on HWMAC. The results of those studies have formed the basis of the referendum information prepared by WDC for voters. WDC used the Deloitte reports to prepare their Referendum Brochure, which was posted to all registered voters with the voting papers on 14th May 2015.